Each summer, the First U.P. Church of Crafton Heights, through its Open Door Youth Outreach, sponsors a free five-week day camp for as many as 50 neighborhood children. Because we invite these children and their families to worship, we often try to have a theme for our time together on Sundays. In 2016, we have been listening to the story found in the book of Ruth. Our texts for Sunday July 17 brought us to the end of the story in Ruth 4 as well as Paul’s statement about the redemptive work of Christ in Ephesians 2:14-17. Did you hear the debate? It was quite a while ago, but – WOW – was it powerful! I wanna tell you, it was a real scorcher. The fellow on the right – the old guy with the white beard – he made a strong case for what we might call “traditional values”: you know, a return to the things that made the country great back in the day. He was particularly tough on immigration and what we might call “multiculturalism”, and he was campaigning on a platform that proposed legislation that would not only prohibit marriage to foreign-born people, but would declare any such marriages to be invalid and would immediately deport the foreign wives and any children from such marriages. It’s all there in the Old Testament book of Ezra, chapter 10. Ezra, and his buddy, Nehemiah, said that the anger of God had descended on the nation because so many foreigners had come and led people away from the truth. The legislation that they proposed won in a landslide – there were only four people who went on record as opposing their action. And so they built a wall and sent the immigrants packing. But then the woman started speaking. It was hard to understand her because of her accent, but she talked about the idea that there is no single perspective that can capture the entirety of God’s majesty. She didn’t say this in so many words, but she sort of implied that if anyone thought that he or she had God fully figured out and understood God completely, then that person had to be wrong because God is so much more than any human mind can comprehend. 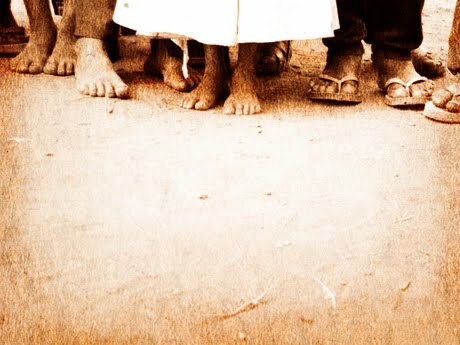 [God’s activity in the world is amplified as people go] beyond the limits placed upon them by society. The social definitions of ethnicity and gender are not only unhelpful but they block the successful solution of life’s problems. Inclusion and the violation of role limits become the proper ways of living out one’s faith in the midst of a pluralistic world. To be honest, the woman didn’t speak nearly as much as the man did in the debate, but she sure showed her intentions and her heart in the ways that she acted. She demonstrated her heart for God and for God’s people in the way that she lived. This was not, of course, a “real” debate – at least, not one that we saw in person. On the right, as I’ve mentioned, we have the historical figures of Ezra and Nehemiah, two of Israel’s leaders who brought the nation back from a punishing time of exile in Babylon. Ezra and Nehemiah understood, rightly, that much of what had led people into the place of exile and separation from God was the pagan practices that they had learned from their neighbors as they gave up on following God and instead followed the selfish desires of their own hearts. They reasoned that much of what had led God’s people to engage in such pagan practices was their willingness to enter into marriage with non-believing, foreign-born spouses, and so the solution that they proposed was simple: ban foreigners, end mixed marriage, and thus stay pure as God’s holy people in God’s holy land. As I mentioned, you can read a lot more about where these folks are coming from in the books that bear their names. The author of the Book of Ruth gently counters this logic by reminding people that if it weren’t for foreign women, Israel would not have the greatest leader it ever knew, King David. This man who captured Israel’s heart and who led the nation into new places of obedience and success was at least 1/8 Moabite. In David’s story, we find a stunning bit of irony, in fact. 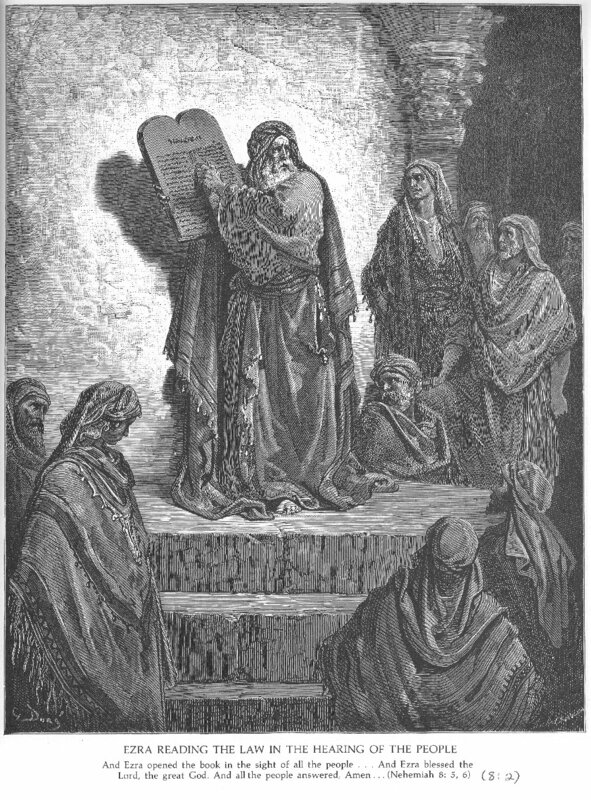 A strict interpretation of the law as found in Deuteronomy 23:3 would declare Ruth’s marriage to Boaz invalid, and that any descendants of that marriage (up to the 10th generation) were to be excluded from participating in the worship of God. Since King David was Ruth’s grandson, that means that he should not have been allowed anywhere near the tabernacle. And take a look at the Psalms – the hymnbook that we’ve carried around for 3000 years: all of the best songs were written by someone who, according to the strict reading of the Law, wasn’t even supposed to be here. 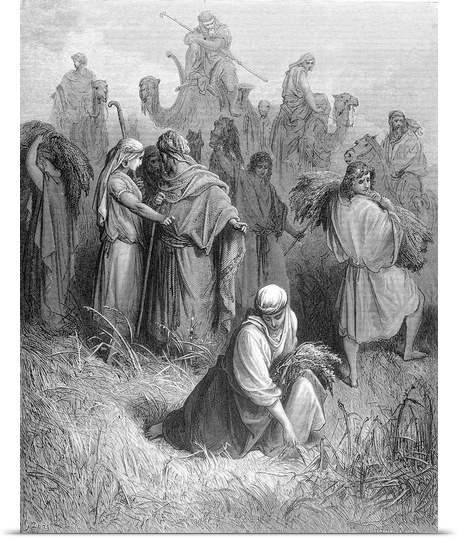 Boaz’ role in the Book of Ruth is to serve as what is called a “guardian-redeemer”. This role is well-defined in Leviticus 25 and other places in the Law. When an Israelite man dies, it falls to his brother to take responsibility for the man’s widow and to do everything that he can to ensure the survival of the family, even to the point of providing a son who will continue the dead man’s legacy. If there is no brother, then the next closest relative is responsible to make sure that the widow is cared for and that the line continues. In the book of Ruth, we have seen a young woman, poor and humbled and despised for her status as a foreigner, come to Boaz and ask him to fulfill the role of “guardian redeemer” in her situation. Even though Ruth represents a family that has acted against the strict interpretation of the Law, Boaz acts in grace toward Ruth and Naomi and so presents to them, and to us, a picture of the face of Christ. Boaz sees these widows as those who are forced to contemplate a life of poverty, fear, exclusion, and homelessness and who then takes steps to offer himself to them in the hopes of correcting that. As you might imagine, not everyone can do that. In Naomi and Ruth’s case, there was a man who was, legally, more responsible for their care than was Boaz. He could have, and perhaps should have, said “yes” to their plea, but he did not. He passed the torch to Boaz and said, “If you would do this, you’ll not only be helping these women, you’ll be helping me, too.” And, as you saw, Boaz was able to act in the interest of Naomi, Ruth, and the entire community by offering himself. Through his actions, Boaz communicates Christ. His person and character illustrate the incredible hesed (compassionate loving-kindness) that Christ possesses for his people, as well as the great measures he is willing to take to redeem his bride. Though Ruth arrives at Boaz’s bed empty-handed and humbled to the core, Boaz treats her with respect and kindness (3:10-13). Disgraced by her position and despised for her ethnicity, the young Moabite woman appears to have little to offer. Yet, despite all this, Boaz views her as a worthy woman (3:11). Though Ruth comes from a family that has turned their backs on the Lord, the Lord turns his face towards Ruth and reveals himself to her through Boaz. Boaz foreshadows Jesus Christ, the ultimate kinsman redeemer who will redeem a bride for himself—the church. Jesus, like Boaz, took on a problem that was not his so that we could have a chance to become what we were created to be. In this way, I’d suggest that Boaz and Jesus ended any debate between Ezra and Ruth. Each of them acknowledges the truth that when we leave God’s intentions, we can die; when we seek out less than God’s best, we are diminished. It is possible, but surely not wise, for us to pollute ourselves and our world by embracing things that are counter to God’s purposes. Yet as they call us to remember this truth, they also remind us that it is God, not us, who gets to define those purposes. It is God, not us, who sets the boundaries for the world. 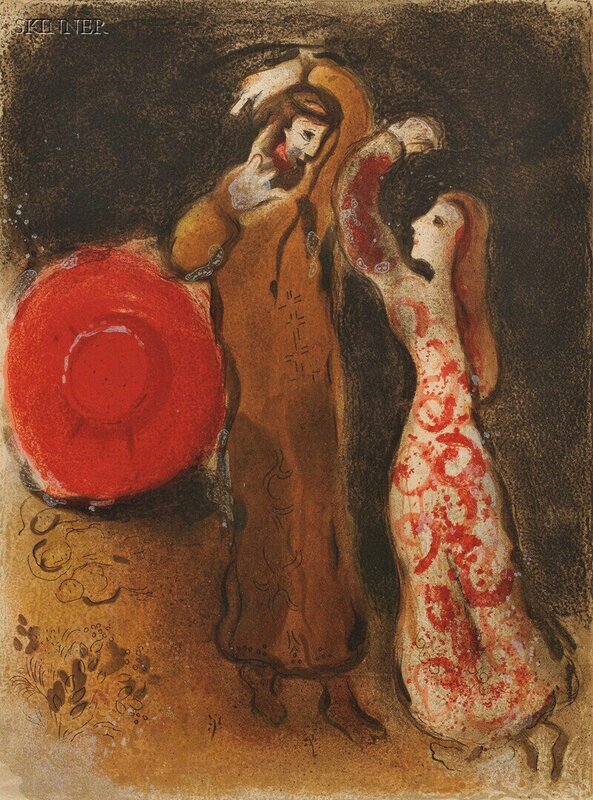 The solution for Ruth and Naomi and Boaz was not to build higher walls, to spark more violent protests, or to shout louder than their adversaries. That was clearly not the solution for Jesus, either. And that makes me wonder why I would imagine that it’s a solution that would work well in my own life. It would seem to me as though this story of Ruth invites me to look across at someone whom I might identify as being “other” and do my best to discern in what ways I am called to walk – with that “other” – into the intentions of the One who created us both. I think that there is a word here for the protester and for the policeman… for the light-skinned and the dark-skinned… for the one who trumpets adherence to “family values” (however that one chooses to define that term) and to the one who wears all the colors of the LGBTQ rainbow… to the one who just got off the boat and to the one whose great-great-great grandfather was born here… To the born-again, sanctified Christian and to the Muslim as well as the Jew and the atheist… It seems to me that the key is not to push against each other and yell and scream more loudly, or, worse, to blow up more of theirs before they have the chance to blow up yours… but rather to walk in the steps that God has laid out for you in the hopes and in the expectation that God knows God’s heart, God’s purposes, and God’s intentions and that if we are able to submit to those things we will discover how to live more Christ-like lives ourselves. There is no healing in pretending this bizarre violent stuff is not going on, and that there is some cute bumper sticker silver lining. (It is fine if you believe this, but for the love of God, PLEASE keep it to yourself. it will just tense us all up.) What is true is that the world has always been this way, people have always been this way, grace always bats last, it just does–and finally, when all is said and done, and the dust settles, which it does, Love is sovereign here. I know that this sounds incredibly idealistic. I know that you may think me to be naïve; and yet it is apparent to me that the way of Boaz and Ruth and the way of the cross requires me to choose to act first out of love and humility and inclusion rather than in hostility or revenge. I confess that my heart is not pure, and that one way for me to make it purer is to learn to sing some of the songs that were written by the descendant of a Moabite woman. I want to offer the strength of my arms and my back and my legs, not to wreak havoc or inflict judgment or mete out revenge, but to protect the weak and restore the broken and search out the lost. And I’ve come here, to this congregation and to the Church of Jesus Christ in the world, to meet with those who, like me, are called to walk in the way of the cross. May we remind each other, and the world around us, that grace does bat last. That the game isn’t over. And that love always, always, always wins. Thanks be to God for the One who sought to reach out to us when we were so far away. Amen. Jon L. Berquist, Judaism in Persia’s Shadow, A Social and Historical Approach, Fortress Press, 1995, pp 223-225. Each summer, the First U.P. Church of Crafton Heights, through its Open Door Youth Outreach, sponsors a free five-week day camp for as many as 50 neighborhood children. Because we invite these children and their families to worship, we often try to have a theme for our time together on Sundays. In 2016, we have been listening to the story found in the book of Ruth. Our texts for Sunday July 10 included Ruth 3 and Philippians 2:1-4. 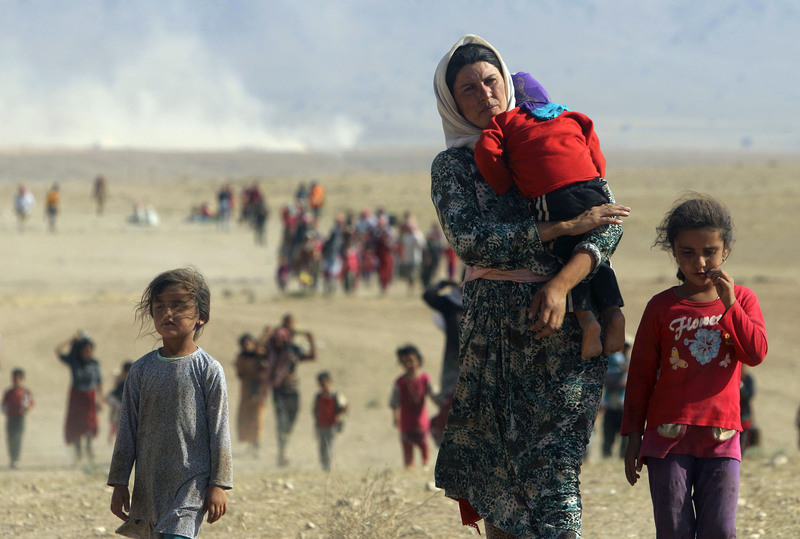 Famine leads to despair, and despair creates refugees. Refugee camps and slums lead to more violence and death, which in turn creates more long-term poverty and systemic dislocation, which breeds resentment and ethnic hatred. It’s what happened to Naomi, Elimilech, and their family; it’s what has happened to 60 million people on the planet this morning. So even if you’ve never heard of Naomi or Boaz or Ruth, I know you’ve heard this story of famine and refugees before. In the book of Ruth, these challenges provide our hero, Ruth, with an opportunity to work that leads to encouraging the community to structure itself so that there is a better chance for long term healing, growth, and survival. Now, so far in our story, the driving force has been Ruth’s desire to care for Naomi, the destitute and elderly widow who at first finds herself bereft in a foreign land, but eventually comes home to Bethlehem. While they were still in Moab, Ruth promised all she was and ever would have to ensuring her mother-in-law’s survival. 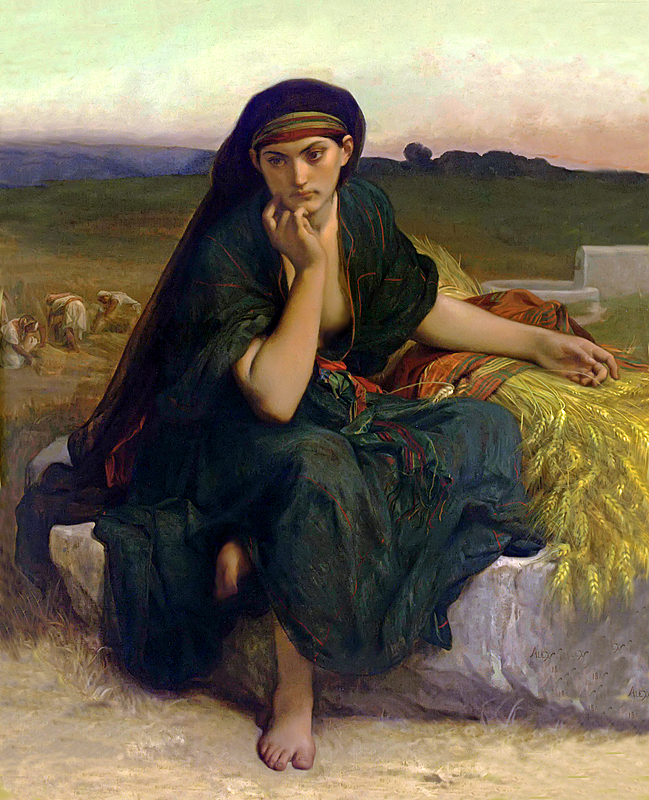 When they moved to the land of Judah, Ruth took it upon herself to go out and look for food to sustain the two of them. Thus far, our story has been about Ruth’s devotion to Naomi. Today, there is a slightly different angle that emerges. For what is really the first time, Naomi voices her concern for Ruth’s security and future. I know that back in chapter one she said that she had Ruth’s best interests at heart when she tried to send the younger woman away, but when we read that, it sure sounded as if Naomi was so trapped in her own grief that she was simply driving everyone away from her, rather than genuinely caring about her daughter-in-law. Now, I should probably include this caveat every single time I open my mouth, but it’s important to note this morning that there are a lot of ways to view the events that are described here in Ruth 3. If you’d like, I will invite you into my study to consider the perspectives of a number of authors who are way smarter than I am and who choose to read this scenario differently. Yet as I overlay the passage at hand with the life of this community and the needs of the world, I am choosing to view this part of our story with an eye toward seeing the main characters as individuals who are willing to take personal risks that result in opportunities for someone else to thrive. I believe that this is a story about people who could have chosen to focus in on personal gain of one sort or another, but who decided to act in the someone else’s best interest. 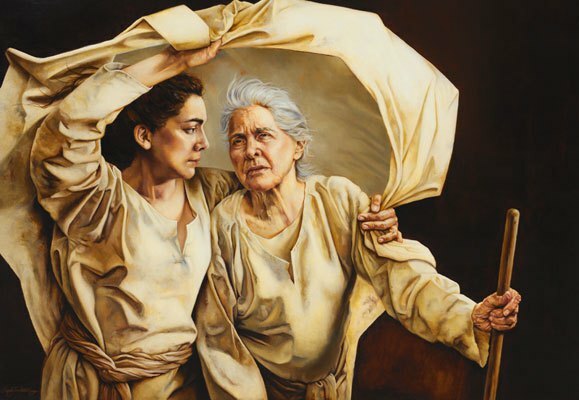 Naomi, in chapter three, strengthens Ruth even when there is no guarantee that Ruth will stick with Naomi in the days to come. 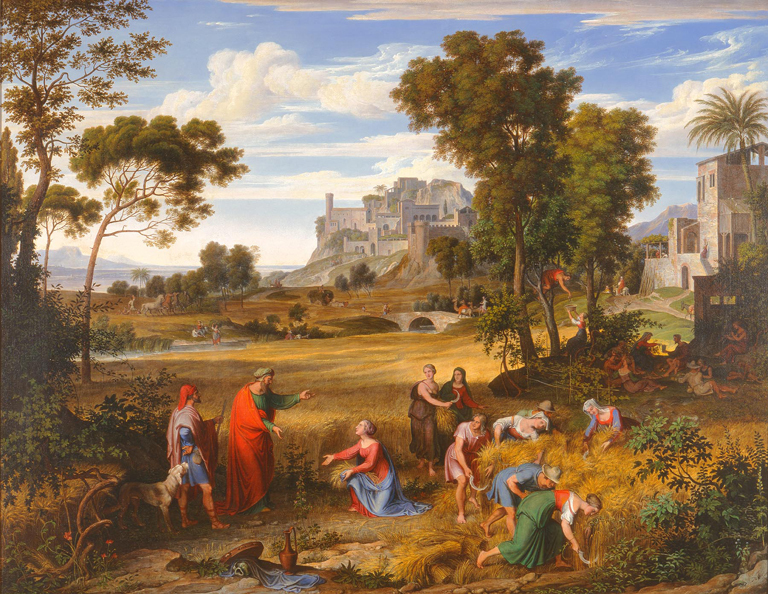 Right now, Ruth is going out and engaging in the menial labor of gleaning that provides Naomi (and Ruth) with three squares a day…but if Naomi’s plan works, Ruth will have a measure of independence and freedom that will allow her to turn her back on her mother-in-law, should she so desire. Similarly, Ruth is exceedingly trusting here in chapter three. She follows Naomi’s advice, even when for all the world it appears as though the older woman is dressing her up like a prostitute and parading her through town. The whole plan hinges on Ruth’s ability to have a private meeting with Boaz in a public space. Can you imagine what would happen to Ruth if the perception was that she was a vulnerable young foreign beauty who was looking to earn a few dollars by spending time with the field hands? There is a lot that could go wrong with Naomi’s plan, and if it would go wrong, Ruth would surely bear the brunt of it. And Boaz has his own set of risks here. He’s thought to be such an upright man, but what will happen if he’s found in the fields with a gleaner-woman? He could have worried about becoming a public spectacle, but rather he chooses to be more concerned for Ruth’s honor and safety as well as Naomi’s well-being. In this private meeting, Boaz offers nothing but support and encouragement for Ruth even as he pledges to do the same publicly. Each of the three main characters in this chapter had the opportunity to choose to act out of fear, mistrust, or selfishness, and yet each chose to risk reputation, future, or even self for the sake of others and the community. If I may, I’d like to highlight a bit of fairly recent history as an example of how this kind of choice might look today, even if it is rare in our world. Not long after modern Israel became independent, the first Arab-Israeli war broke out in 1948. For decades, Jews and Arabs traded violence and hatred. When he became US President in 1977, Jimmy Carter sought to broker an agreement that would lead to a lasting peace in the Middle East. He sought out meetings with Israeli Prime Minister Menachem Begin and Egyptian President Anwar el-Sadat. Although there was initially some progress, the talks quickly stalled and it appeared as though things would always be as they had always been. President Carter’s wife, Roslyn, suggested that the President invite these two old adversaries to a place that had become special to him, Camp David in Maryland. 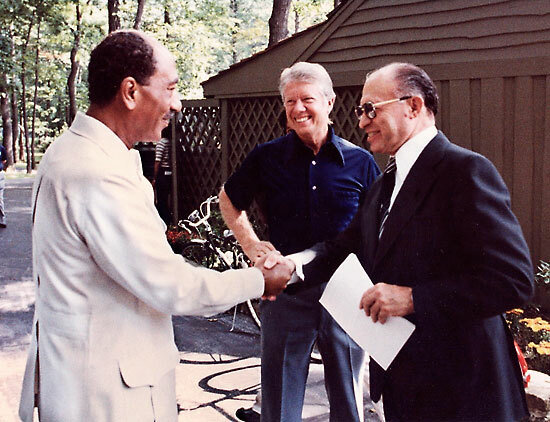 L to R: Anwar el-Sadat, Jimmy Carter, Menachem Begin at Camp David in 1978. For thirteen long days, the leaders of these three countries met in secret. It was an enormously risky process for each of them, because typically heads of state only show up at meetings once their “people” have determined the outcome and laid the ground rules. There were times when Sadat and Begin refused to talk with each other, and Carter carried notes from one to the other. But finally, on September 17, 1978 the “Framework for Peace in the Middle East” was signed by these three world leaders. Much of the world reacted with hope and a cautious optimism. When the treaty was accepted by Israel, Egypt was punished by the other Arab nations. Not long afterwards, Anwar el-Sadat was assassinated by a member of his inner circle. It was a costly, costly peace process… but it remains a shining example of leaders who are seeking the best hope for peace and justice for all, and not merely seeking to increase their own influence or prestige. You can say, “Are you crazy, Carver? Do you know what they’re doing in the Middle East?” I do. And I have crossed the border from Israel into Egypt, and I am here to tell you that it’s a much better situation than most borders between Israel and her neighbors. Because men of courage and vision risked something. Can you imagine anything like that in our own day? Three world leaders who are willing to take the time and energy and risk necessary to hammer out a complicated agreement? As you mull on that example from history, let me invite you to compare that narrative with that of the current day, where each of the major political parties in the United States has selected the most militaristic person possible to stand for election as president. If all you knew about the United States was what you read in the papers or saw on the news, you might conclude that a top priority for this “Christian nation” is making sure that we elect leaders who are prepared to bomb our enemies back to the stone age if that’s what’s necessary to preserve our power and prestige. Let’s be honest: we worship power and prestige. We want to be best at everything, first in every line, and to have more than anyone else. We resent being inconvenienced, intruded upon, or asked to do something or love someone that isn’t to our liking. We believe that everyone ought to be treated more or less equal, or at least nearly as well as we are treated. We want to be safe and secure and comfortable – for God’s sake, we want to be comfortable. And here comes Jesus, talking about humility and service and self-denial and personal sacrifice and caring for others ahead of yourself. Asking us – no, expecting us to get into line behind him and act like him when all we really we want is a ticket to heaven when we die. As if we would be comfortable living the life that he lived. Exactly! Did you see what they did to Jesus? I saw The Passion of the Christ. Wow, that was intense. And gross. No thanks, Jesus. I’m not into that. I’m telling you, for as much as all the politicians like to hang around Jesus at election time, the real Jesus couldn’t get elected as dogcatcher in this town. Allow me to conflate the stories of Jesus and the words of Paul and the narrative from Ruth and suggest that while the Gospel does not instruct us to simply roll over and denigrate ourselves, there is pretty clearly a biblical model here to extend yourself, to risk yourself, perhaps even to lose yourself on behalf of another. You saw it already in the scripture reading: Naomi lent Ruth some of her “insider” privilege in the culture in which they lived. Ruth promised Naomi all of her youthful energy and devotion. 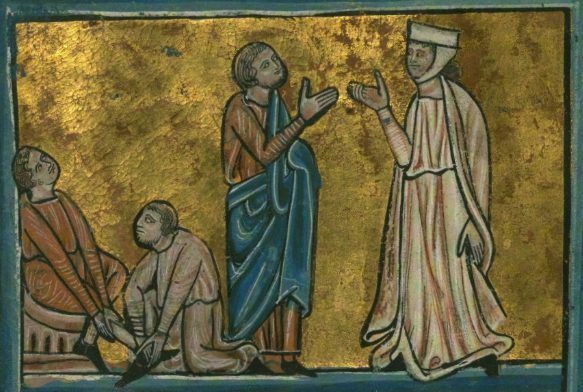 Boaz shared deeply of his wealth and honor as he extended both his wallet and his reputation on behalf of these poor women. So go ahead. I dare you. Look for ways to enter into someone else’s experience this week. Acquaint yourself with the sense of powerlessness and frustration that so many of our neighbors deal with day in and day out. You want ideas on how to do that? Holocaust Survivor Elie Wiesel died recently. Although his life was complicated in all sorts of ways, you would do well to set aside an evening this week and read (or re-read) his short book called Night, which details the horrors of the treatment that the Jews received at the hands of the Nazis a couple of generations ago. And think about what that book says about the refugee camps and walls and fortresses of our own age and the people who would build them and those who profit from their existence. And what about the other events that dominated much of this week’s headlines: the death of several young black men as a result of encounters with the police and a horrific attack on police who were patrolling what by all accounts was a peaceful protest and lament over these deaths. Very few of us in this room know how it feels to be profiled while driving in the “wrong” neighborhood or shopping in a strange grocery store… but I am here to tell you that for many of your neighbors and some of your friends, that’s a daily, if not hourly occurrence. Very few of us know how it feels like to show up for work wondering if there’s someone waiting to kill you simply because of the job to which you’ve been called, but that is the reality for many of our law enforcement officers. Look for ways to be present in conversations that involve people of color. Listen for their stories, and accept them as opportunities to see the world from a different perspective. Refuse to give credence to, and for God’s sake don’t be a part of passing on horrible stereotypes and accusations about what “the police” or “those thugs” or people of color or anyone else is. Refuse to talk about “those people” – whichever category “those people” refers to. And then use whatever influence you have as a result of your race or citizenship or financial status or gender or… or… or… to be you for someone else today. I’m only one person, you say. What difference would it make? I’m not changing anything. Change you. Be remade in the image of Christ anew each morning, and risk who you are for someone else. 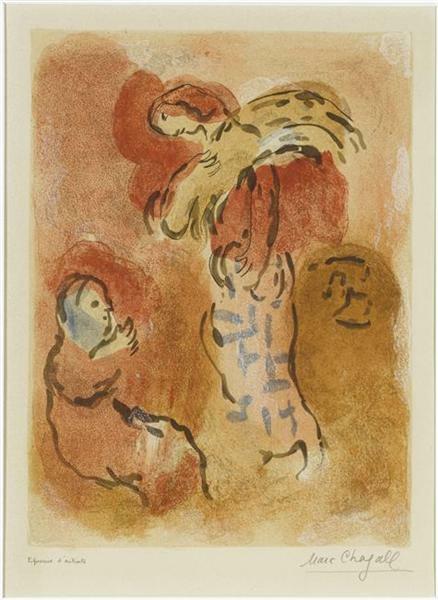 Ruth, Boaz, and Naomi did it… and while we’ve not quite gotten there in the story yet, I’m here to tell you that because these three people decided to risk themselves and trust each other and enter the world open-handed, a baby who would become King David was born. And the world was changed eternally by that. Remember: you’re not making this up. You’re following in the footsteps of those who have brought us to this point, by the grace of God. Amen.